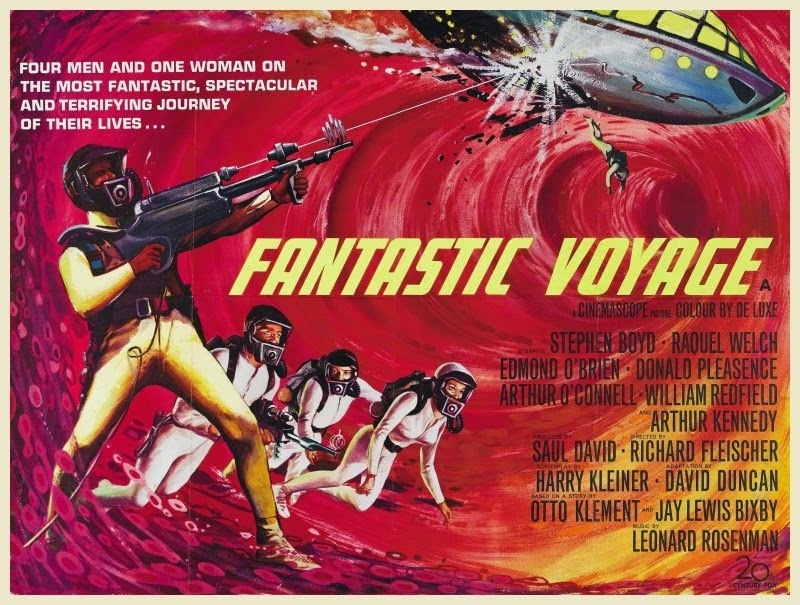 Richard Fleischer's "Fantastic Voyage," 1966. It couldn’t be a more mundane location. 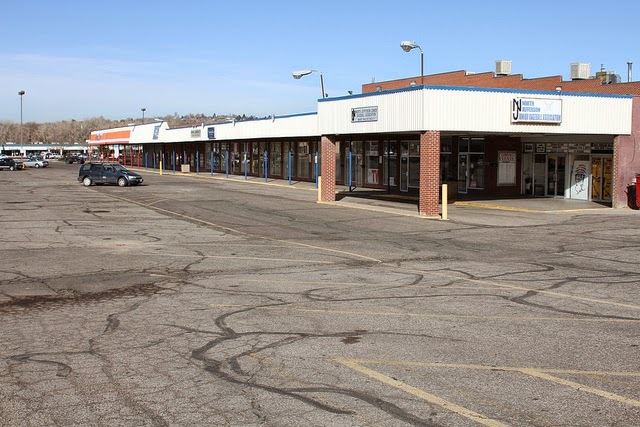 The Arvada Plaza movie theater (9374 W. 58th Ave.) anchored the end of a row of stores at the local shopping mall. It was modestly scaled, strictly functional, and designed with economy in mind. There was no grand façade – just a simple marquee. Inside, there were no decorations, no gilt, no Art Deco frippery – just a streamlined box of a theater, dominated with the burnt orange and sour-cherry color scheme of the mid-‘60s. It didn’t look like an exploding box of dreams, but for me that’s just what it was. From the time we moved to the Denver area in 1967 until I escaped 10 years later, the Arvada Plaza was our local movie house. A decent bike ride or long walk from home, it was a place where we were always welcome . . . even if we weren’t actually old enough to see the movies inside, thanks to parents who didn’t care, a profit-minded theater management, and a staff that usually included some of our neighbors, and older brothers and sisters. This was both problematic and wonderful. We were only forbidden to see such extreme fare as “The Godfather” and “The Exorcist” – but of course we all sneaked away and saw them when they came to our unromantic little home away from home. And were traumatized for life. Being dumped off with a carload of friends, with $1.20 in hand for a ticket and perhaps even A WHOLE 50 CENTS for treats was a Saturday morning ritual, and eventually we branched out into catching whatever opened on Friday night. 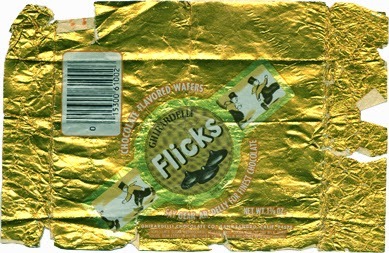 I still remember the burning scent of overtaxed vacuum cleaners in the lobby, and the solid, waxy taste of my most beloved Flicks chocolate-drop candies, which came in a cardboard tube covering in glittering foil and a logo of a Dutch boy running towards or from something . . . I could never figure out what. The tubes made excellent blowguns after emptied, and we would routinely assault each other if the movie wasn’t that hot. Occasionally, an extremely unmotivated usher might appear and caution us to keep it down. Here are some of the films I saw there that really stuck with me. The dates attached are initial release dates. Hard as it is to believe in this age of instant gratification but in some cases, we got the movie a year or more after its premiere – such were the mechanics of film distribution at the time. The conceit that an epic film can be made inside the human body worked for this 6-year-old. Richard Fleischer, son of master animator Max, was one of those hit-or-miss directors who have made some remarkable films (the original “Narrow Margin,” “20,000 Leagues Under the Sea,” “10 Rillington Place,” “Soylent Green”) and some absolute train wrecks (“Doctor Dolittle,” “Mandingo,” the Neil Diamond “Jazz Singer,” Amityville 3-D”). 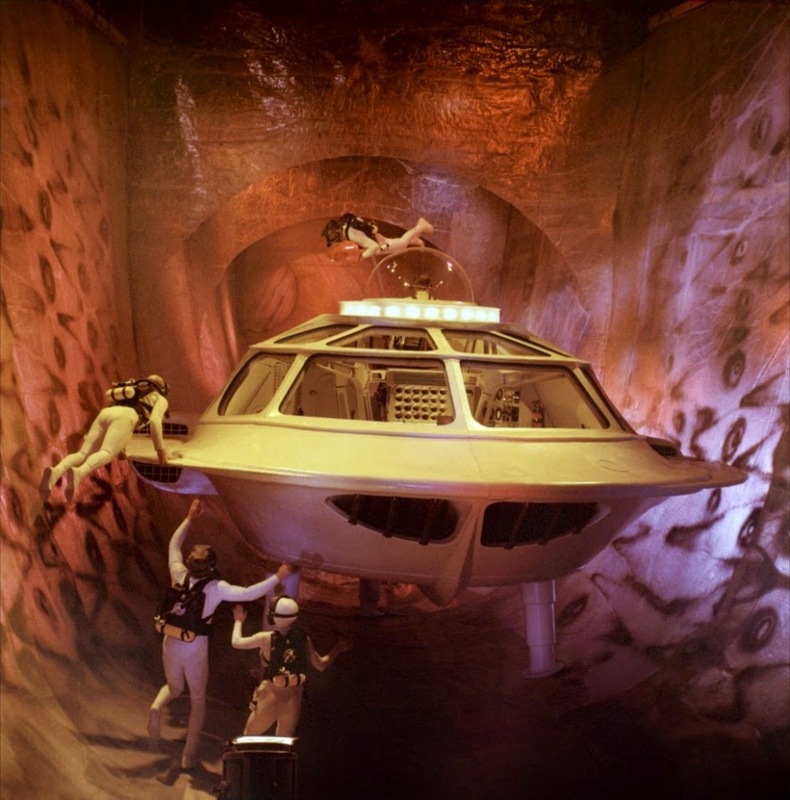 It’s a Cold War-themed sci-fi thriller, complete with Bondian operative (Stephen Boyd) and a miniaturized submarine full of saboteur suspects, including a saintly surgeon (Arthur Kennedy), his lissome assistant (Raquel Welch), an affable pilot (William Redfield) and the shifty, shuttering Dr. Michaels (Donald Pleasence). 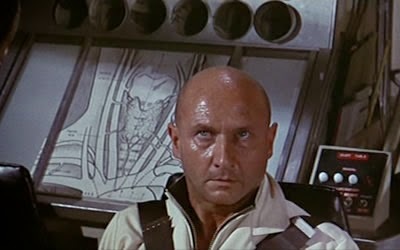 Note the patented gloomy stare and suspect sweat of exemplary film villain Donald Pleasence. Guess who the saboteur is! You see, in a world where miniaturization is possible an hour at a time, a genius defecting to Our Side carries the secret to indefinite miniaturization in his mind, but is injured after an assassination attempt. The CDMF (Combined Miniaturized Deterrent Forces) team has to be shrunken to microbe size and injected into the patient to eliminate a blood clot in his brain so that, presumably, he can wake up tell us what he knows and we can create tiny armies and beat the Russkies. Of course, the team only has 60 minutes before it returns to normal size, which tends to damage the patient. So we have a ticking clock, huge graphic interfaces in a NASA-like control room, scuba divers on high-wire harnesses, and fanciful art direction. The typical military men are played by typical military men -- character actors Edmond O’Brien and Arthur O’Connell. If they could have squeezed in Whit Bissell, we would have had the trifecta! 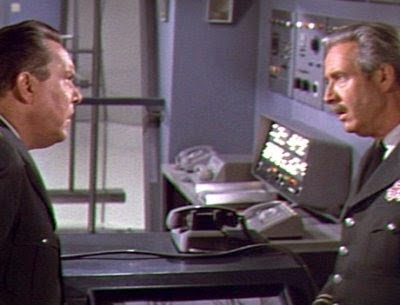 O'Brien (left) and O'Connell expressing concern in the control room. The film does as well as one can hope for a pre-CGI vision of the human body. 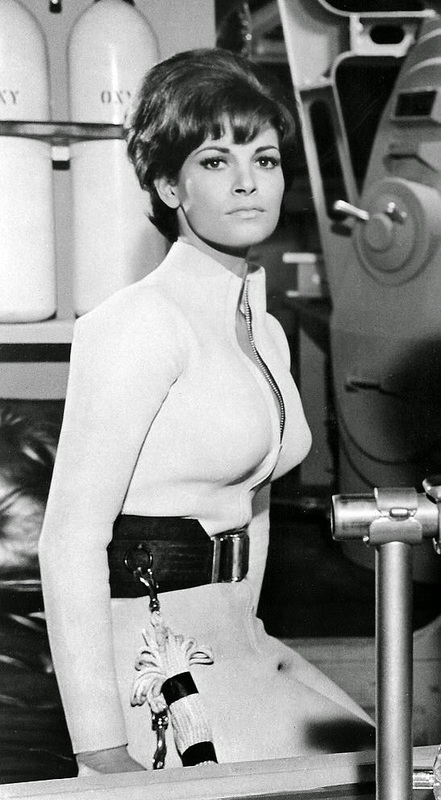 One body that stood out in particular was Raquel Welch’s -- the primary actors are described, in the sexist parlance of the time, as "four men and a BEE-YOO-TI-FUL girl"; she was ogled an appropriate amount for a movie of that era, and her staid beehive hairdo is in stark contrast to the racier silhouette of her extremely pneumatic diving suit. Note the assertion: "THIS IS THE WAY IT WAS". . . . "a savage world whose only law was lust!" What do you get when you combine Britain’s Hammer Studios (lurid color horror), stop-motion animation genius Ray Harryhausen, and Raquel Welch in a fur bikini? A moderately interesting, staggeringly inaccurate fantasy film (dinosaurs vs. cavemen) that makes money. As Tumak says, "AI-YEEE!" I mention this trip to the movies not because of the feature, but because this is when I saw the trailer for “Bonnie and Clyde.” (“NO CHILDREN’S TICKETS SOLD” trumpeted the ads. )What’s going on here? Is it a romance? There's faux-Copland Americana scoring under the initial montage. Wait now they're shooting. Now it's a comedy? There’s banjo music and Denver Pyle and . . . oh Lord they just shot someone in the face! I stripped my gears as I tried to fathom it. I can’t find the trailer I saw in digital records, but what sticks with me 50 years later is the brief vision of Faye’s Dunaway’s body as she races to her closet and throws on a dress after catching Clyde stealing her mother’s car. That glimpse did something to me. Dunaway in "Bonnie and Clyde" -- her nakedness obscured and punctuated by symbols of the domesticity she's about to spontaneously spurn. I wasn’t quite sure what it was that I had seen, but I found nekkid ladies profoundly interesting. And I made a mental note to see more of them when possible. 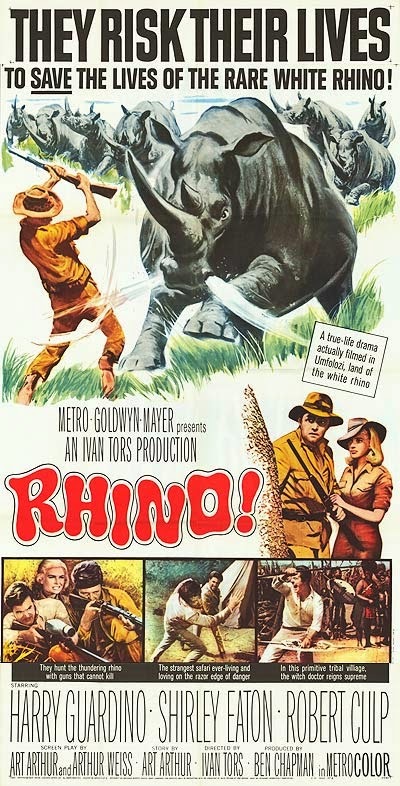 This 1964 film about saving megafaunic ungulates was no winner in itself, save for a classic Harry Guardino bad-guy performance, a lovely Shirley Eaton (who was to next play the ill-fated, gold-plated Jill Masterson in "Goldfinger"), and nifty little score from Lalo Schifrin. However, it was my first and most treasured kiddie matinee at the Plaza. This was probably near the final manifestation of an old-fashioned “full” film program, recreated by a theater manager who must have wanted to recreate the good old days. For our money, we got previews, a Pink Panther cartoon (really hated them), and a chapter of the old 1954 Western serial “Riding with Buffalo Bill,” before the film! After the show, they held a drawing, called my ticket-stub number, brought me up to the front . 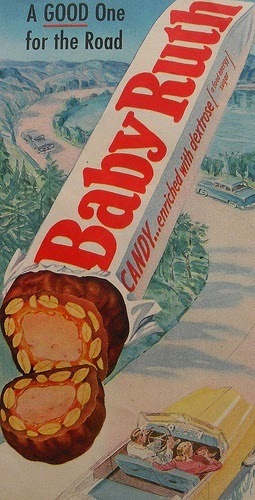 . . and laid a Baby Ruth bar on me the size of my forearm. I don’t recall winning another prize, but I was a faithful Saturday attendee for years. NEXT TIME: Charlton Heston’s Superapocalyptic Trilogy!